I have to tell you about this blog I happened to find and LOVE! I saw a post she made on Hometalk about her living room transformation and I was amazed, so I snooped around on her blog and saw her home tour and immediately decided to follow her. The website is seekinglavenderlane.com. CHECK. IT. OUT. 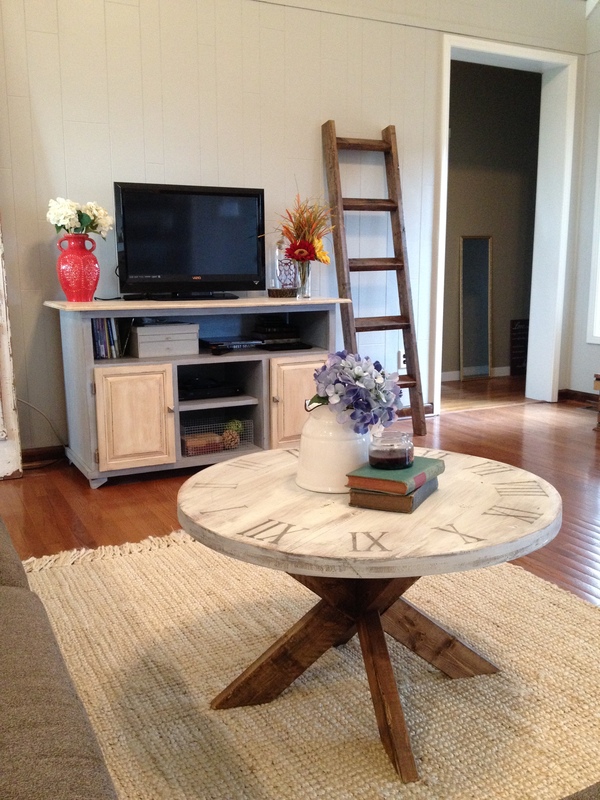 I know, this post is about a coffee table. Get to the point, Shara!!! 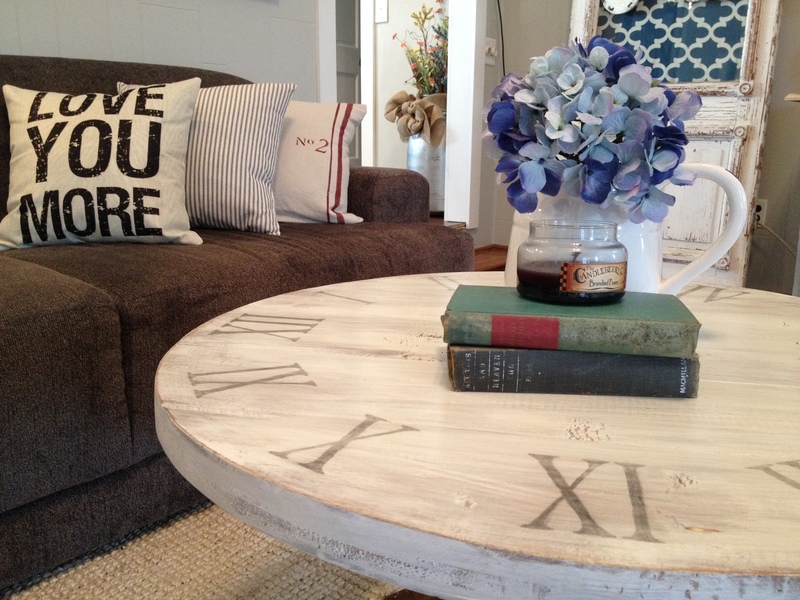 So while I was “touring her home,” I caught a glimpse of this coffee table painted like a clock and it was adorable! I decided I wanted one…which I do often ha! She had a post about how she turned her dining table into a super cute clock coffee table. Check it out here. 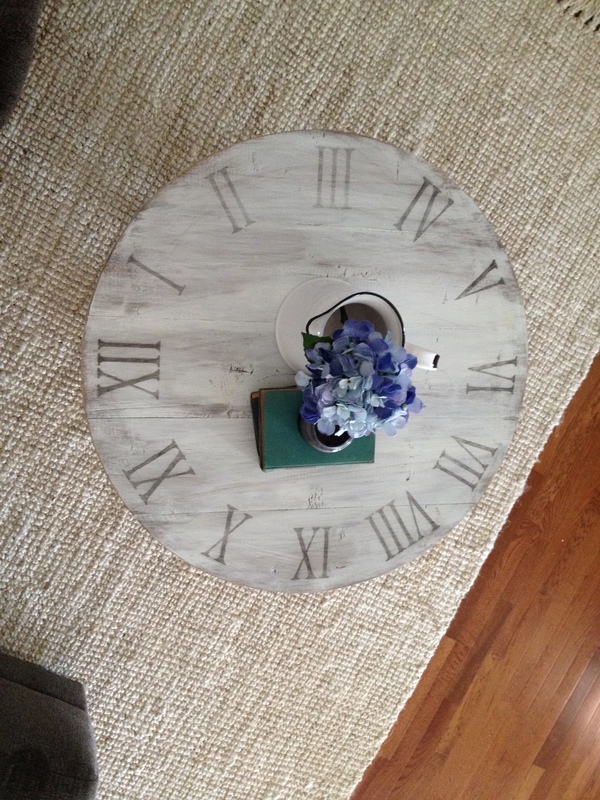 But, instead of buying an existing table to paint like a clock, I wanted to make my own. Go figure. But, I didn’t know exactly how I wanted to make it. 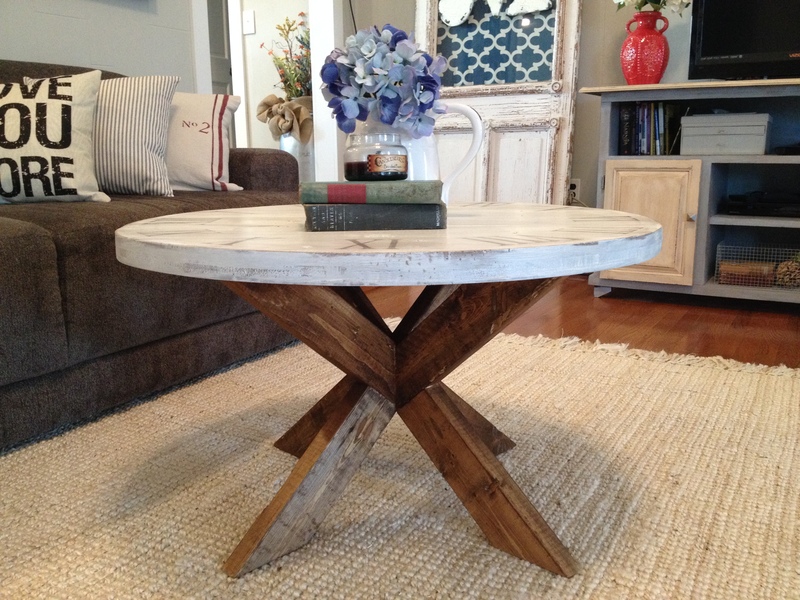 I remembered that I had seen in a Pier 1 magazine MONTHS ago this super cool table base that was like two big Xs attached perpendicular (remember that geometry stuff?) to each other. I liked it, but the price tag was $100 and I was busy with other things, so I never tried to make my own…Until I found this tutorial. AND, now I had a reason to make one. The bad news is that this plan made the table too tall and too narrow for my coffee table. Thanks to my sweet geometry skills, I was able to modify the plans to fit my needs. Let’s be honest, even someone with a BS in math can sometimes forget that the angles of a triangle must sum to 180, right. No? Oh…. Note: This post contains affiliate links. Please see disclosure policy for more details. As always, though I may receive a small commission if you purchase a product I link to, I only link to products that I highly recommend or personally use myself. 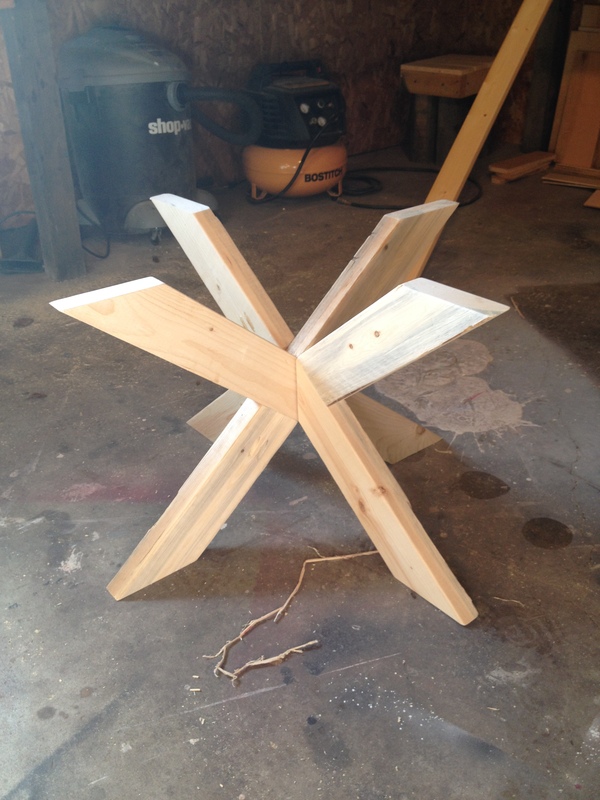 I adjusted the angles and measurements to make the table be about 18-19″ tall, and about 30″ wide. (I made the top 34″ diameter.) I basically cut to fit here–no special calculations were used. I changed all the 50 degrees in the plan to 40 and all the 40 to 50. This made the table “fatter” and shorter. But then I also had to adjust the lengths. All the pieces I just laid out and cut to size. 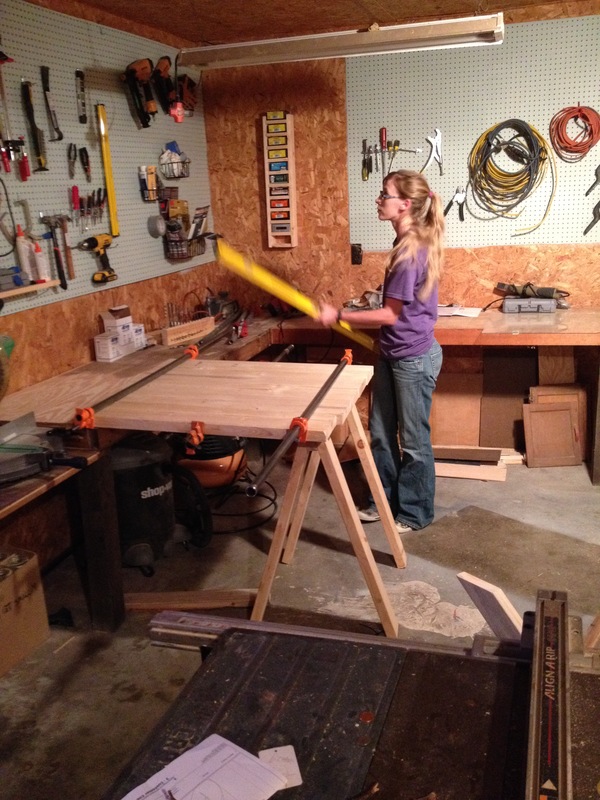 Once you cut the one long piece to be 18″ tall, it’s easy to cut to fit all the other pieces. (If you’d like exact measurements of my table base, please contact me.) I used my Kreg Jig and pocket hole screws to attach the pieces like the plan says. I used pocket hole plugs to cover the holes. I cut 5 pieces of 2×8 board at 3 ft long. I ran them through the table saw to get a nice square edge. Then, I glued the boards together and made sure the top was as flat as possible. I use my Pony pipe clamps when gluing up a table top. 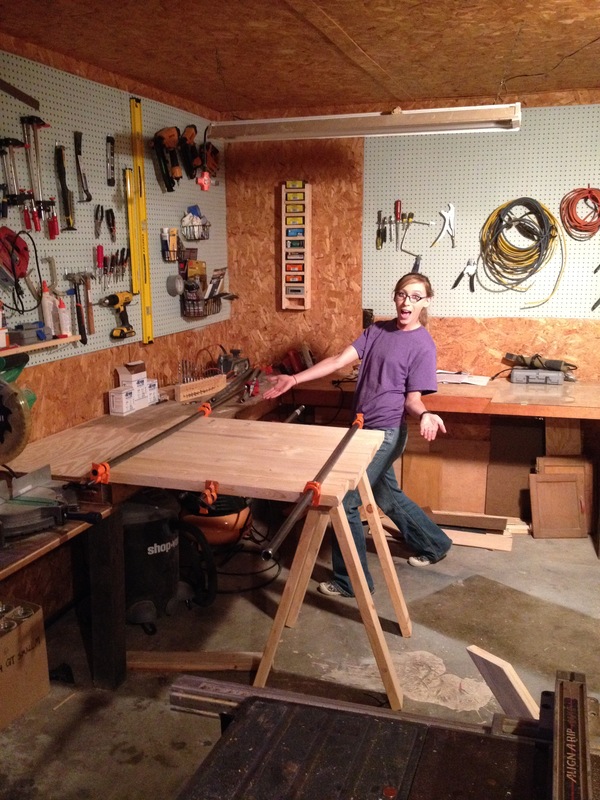 Just make sure to buy a 3/4″ pipe that is long enough to reach the entire width of the table top you are gluing. The next day, once the glue was good and dry, I made a jig to use for my jigsaw to cut a perfect circle. BUT, the wood was too thick and the blade kept bending and popping out. I literally cut about two inches. Awesome. You know nothing ever goes as planned, right? So then I called my dad. PS A jig saw would probably have worked if I hadn’t used a jig for it. If I had freehanded, it would have cut. I’m just not good freehanding with a jig saw and I wanted the circle to be nice and round. 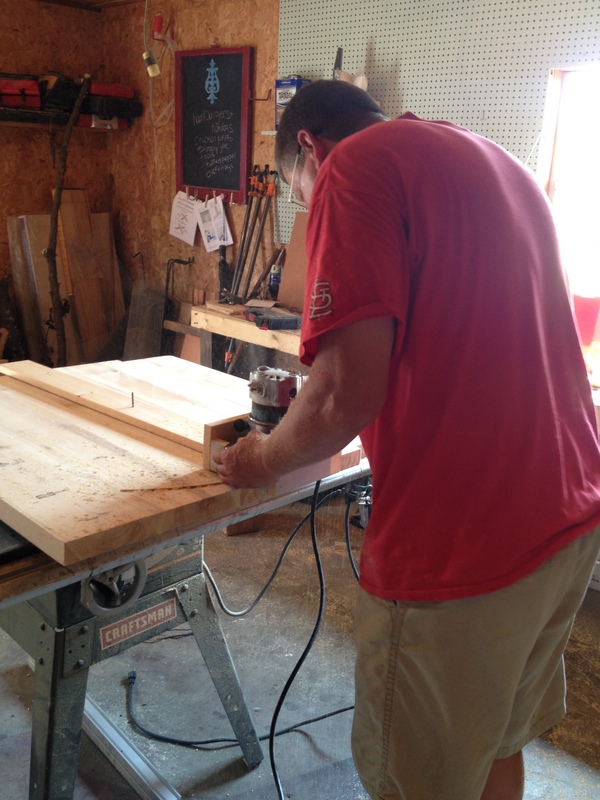 Good ole dad came over the next Sunday afternoon and we set up a jig to cut the circle with a router. We found the exact center of the table top and used a drill bit drilled bit to hold the jig in place. The jig was made out of a 1×4 attached to a little box that the router sat in. We measured from the router bit out 17″ and drilled a hole into the 1×4 at that point. This will give us a table top of 2×17″=34″ diameter. After a few hours of sanding the top and edges, I drilled pocket holes in the top of the four legs of the base and used them to attach the top. Once the screws were in, I used plugs to plug the holes. Then, it was ready to finish. 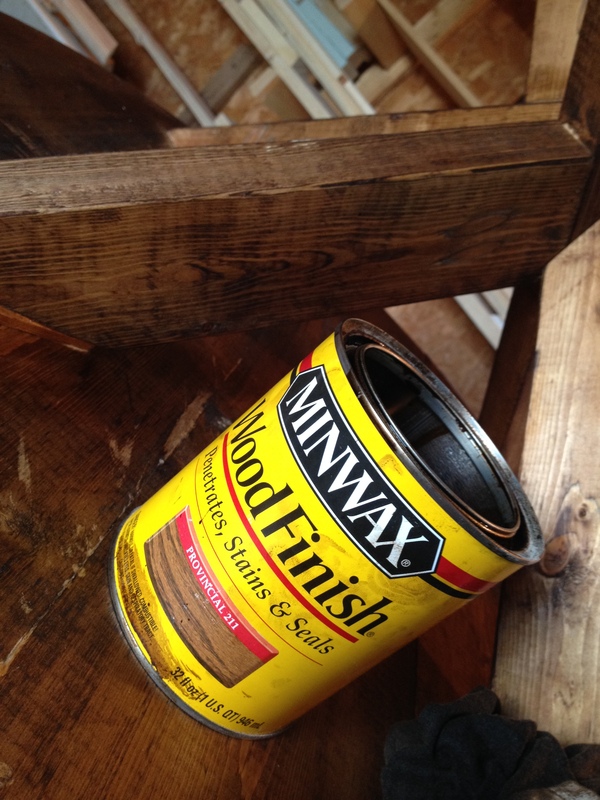 I stained the entire table with Minwax Provincial stain and once it was dry, I dry brushed some white paint on the top. Once the paint was dry, I gave it a light sanding to scuff it up a little. I didn’t have any stencils the right font and size, so I got on Pinterest and found this tutorial for using paper and ink to transfer the numbers. After printing it several times–which is what took me four days (helpful hint, make sure to MIRROR your lettering before printing and make sure you are using INK and not toner), I finally gave it a shot. Once, I got the numbers on the table, I. Loved. It. I added a coat of polycrylic on top because the ink from the letters was wiping off on my hand if I touched it. The poly sealed it in and prevents it from wiping off. After all the work you put into getting those letter on, you want to make sure they are sealed in! Did you notice the cute blanket ladder in the background? That’s what I made when I got mad my jigsaw wouldn’t cut this table top and didn’t have anything else to make in the meantime, but I had an itching to make something. That worked out well, I think 🙂 I just need to buy some blankets ha! There’s Danny enjoying a cat video on his iPad. I had to sneak him in here somehow. So what do you think? Is that cute or what? Best part about it? I made it myself (with help from dad). Second best part? Total cost: about $20-$25 in lumber and a little frustration. Third best part: Now my sister wants one, too….that and a fake fireplace for her living room. Looks like I will be busy for a while. Don’t forget to pin for later! Until then, happy building! Thank you! Now that you mention it, it kind of does look like concrete haha! Can you post the measurements/angles you ended up using to make the bottom? Thank you for reading! I have added some instructions on how I modified the plans. I hope this helps. Please let me know if you try these. I apologize, I didn’t measure the pieces before I put them together, but I am pretty sure the measurements I listed are correct. Thank you! I have sent you an email. Please let me know if you do not receive it! Thank you! I appreciate your overuse of the word “lovely” 🙂 I think he likes to come over and help with projects, too, but he likes to pretend he doesn’t 😉 Dads are so funny. I pinned your twisty table on Pinterest awhile ago and knew I needed two for our bedroom end tables. Upon further digging, I love your designs! 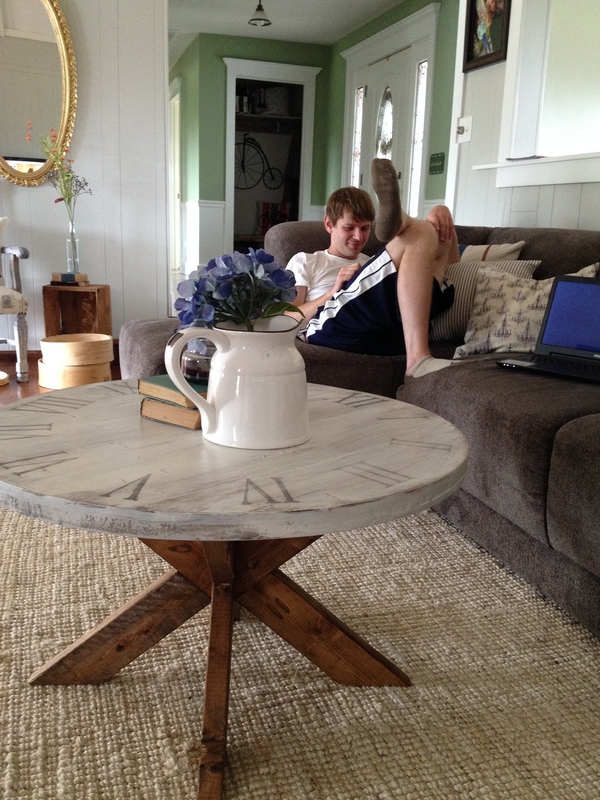 This coffee table is awesome and I need one for myself! 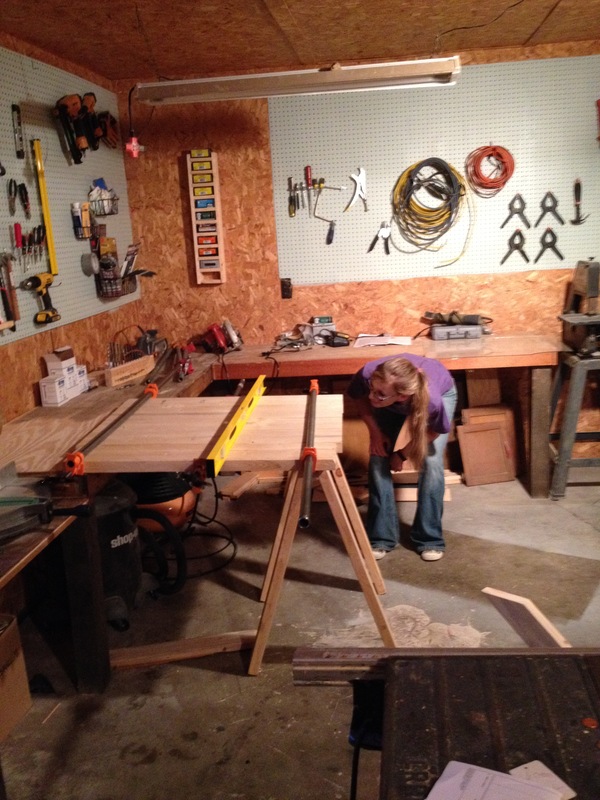 My husband recently purchased a table saw and router and I can’t wait to get going! Thanks for the inspiration!! Awesome to hear! I am so glad you have enjoyed some of my projects and that I was able to inspire you! Good luck with your projects! I would love to see them when you get finished! I love this table. I don’t see any measurements for the base. You do beautiful work and you are so creative. The top looked like concrete when I first saw it. I did not list exact measurements for the base, but if you would like them, I would be glad to provide them to you! Feel free to contact me if you need them! Thank you so much! This is awesome! I am going to build one like this for our kitchen. Love it and thanks for sharing!